To understand the ocean ecosystem, at some point you have to get in a boat. In this travelogue, Dr. Alex Kahl shows us how he collects samples of phytoplankton in Antarctica using a small boat, some bottles and a lot of filters. 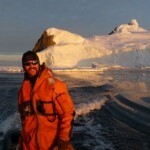 Alex Kahl is a graduate student in Oceanography at Rutgers University. But this California native wasn’t always going to be a science major. Alex explains his story in this online presentation.